BAMBOO 120｜BAMBOO RAYON｜IKEUCHI ORGANIC Inc. The pile on the towel surface changes character gradually under sunlight. 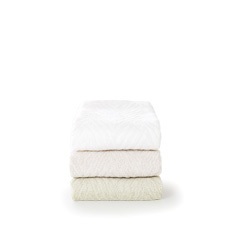 These towels embody the smooth and glossy texture of bamboo rayon. The glossy pile is made of bamboo rayon which soaks water faster than cotton and dries quickly too. 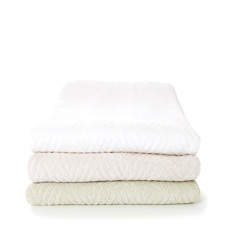 The pile, so soft that tracing your finger leaves marks, is supported by sturdy organic cotton underneath. Bamboo 120 combines suppleness with toughness. Ultra quick at wiping water and quick drying too. By using 100% bamboo rayon pile, we have perfectly augmented properties lacking in organic cotton. Despite this exceptional absorbency, the towel does not feel heavy thanks to the herringbone pattern elaborately woven into the towel surface. 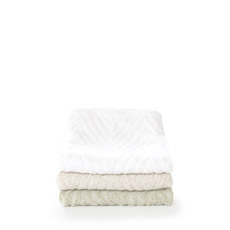 The beautiful zigzag lines of pile laid in opposing directions prevents the towel from feeling soggy, and maintains a soft, dry feel. The cool touch unique to bamboo rayon. This pleasantly cool sensation of Organic Bamboo has been depicted in a selection of cool colors. The smooth bamboo rayon pile is so cool and soft you could use it as a yoga mat cover or toweling blanket. Bamboo 120 soaks up water so fast your hair drier will become redundant, making it perfect for wiping away sticky sweat too. Enjoy the glossy, silky touch of bamboo rayon, with superior absorption and desorption properties.